Speed training programs for the power athlete are major facets. However, everything must be put into place - including a thorough flexibility program. Flexibility of the hips, ankles and shoulders are primarily the “big” muscles that will generate force. 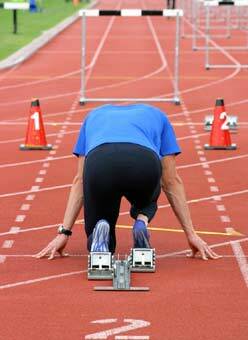 Tightness or restrictions in these primary muscle groups will hinder speed. Any speed coach or specialist will tell their athletes to make sure that these areas are “ready to go” before doing any speed work. That is why it is important to perform speed training exercises. Drills for speed training include: speed specific warm-ups such as dynamic movement preparation while walking and on the ground. These are then coupled with various other exercises based on speed mechanics and form, acceleration, hip drive and foot force on ground. Too often, the athlete will either not warm up or perform static stretching (holding a stretch for a count) or maybe even jog first and then perform sprints. In these cases, the muscles used for sprinting (the large muscles of the lower body) are in a more fatigued state and thus the athlete has a hard time being explosive. Also, running form is sloppy with either short choppy steps or sometimes long overstriding steps. As a result, in many cases that I have seen, muscle pulls or strains will occur. Especially in the hamstrings and hip flexor area. Coaches unfortunately will fall into this trap of the aforementioned lack of the proper warm-up prep. The results will most likely be that his or her team will not be particularly fast and also have a good chance of getting early season injuries. No one is happy! In other words, following the right speed training programs and warm-ups is extremely important for your performance. I will go over the different warm-ups later. For now, I just wanted to briefly explain the importance of warming up and how it will help to acquire speed in your future speed training drills. Here you can read about speed training programs and linear speed. Click here for information about multidirectional speed.